What story arc did your last conference or corporate event follow? Did the programming seem to flow well? Did the key point/theme get lost or confused? Did the message stick with attendees and carry on past the event? Did the audience emotionally connect to the “brand”? If you’re not sure you activated your audience and kept them engaged with your brand’s story and the role they play, it might be time to analyze further. When reflecting on past events, it’s good to ask yourself: “What story and message did I tell my attendees?” If there is no clear, central and unifying answer, your attendees may be left confused and uncertain of their purpose in the organization. Mapping your audience is key. Understand what kind of message you want to send them, what communication works best for them and how to target them appropriately. How you deliver your story is everything – from marketing materials to fonts, colors, presentation style, speakers, and even down to seating arrangements. Once you’ve identified a clear and authentic theme, the challenge is storytelling. Every good story has a beginning, middle and end. A good place to begin is looking back at how far you’ve come. How has the organization been performing (fiscally, morally, publicly, etc.)? How has your journey looked? How have your employees helped this process? What attitudes, struggles, ideas, and experiences got you to where you are today? This is the part in the story where you might as well be gathered around a campfire, roasting marshmallows laughing and enjoying the present. Talk about where your brand is now. How is your brand positioning itself? If it is, what is your next goal? How has this propelled your brand? How does your brand help people? If it’s not working, is this conference about changing strategy? Convey the company’s “state of the union” to your audience. It’s important for employees to understand where the company is at. This includes mindset, finances, thought process, visions, etc. This is also the time when speakers, breakout sessions and other entertainment help drive home the point you are trying to convey. Your speakers and other engagement activities need to have content reflecting that message. If this isn’t achieved, attendees may be confused and unable to understand your brand’s message. Before we get to our last chapter, it’s important to understand why storytelling really works. This is according to Paul J. Zak, founding director of the Center for Neuroeconomics Studies and a professor of economics, psychology, and management at Claremont Graduate University. People are more motivated by how their organization improves lives. By describing actual named customers and how their problems were solved by your efforts, they empathize with the pain the customer experienced and they will also feel the pleasure of its resolution. Oxytocin is produced when we are trusted or shown a kindness, and it motivates cooperation with others. It does this by enhancing the sense of empathy, especially among who we work with. If your story creates tension, your audience will share the emotions of the story’s characters. When we tell stories and use descriptive language, they activate certain parts of our brain as if we were experiencing it. If you say “Sally kicked the ball”, your brain’s motor cortex lights up attempting to understand the meaning and make connections. Your brain is constantly trying to make connections out of everything, this is why metaphors work so well – because we like relating things to our own experiences. Scientists have found our brains are hardwired for stories. 65% of our conversations are stories and gossip according to Jeremy Hsu, a renowned freelance science journalist and tech writer. Our brain knows it activates better while listening to stories due to the fact we attempt to relate to everything to feel a part of something. Depending on how many elements are in a story, every part of your brand can be activated, hence, why you learn better via stories vs. PowerPoints which just activate the language cortex of the brain. Storytelling is authentic and wins over hearts and minds. “Intensify the story with vivid language and intonation. Tap into people’s emotions with language. Use metaphors, idioms, and parables that have emotional associations.” —Susan Fisher, Strategic Communication Expert. According to Fisher, people tend to be under the impression that storytelling is too emotional so stick to the cold hard facts. Storytelling is, in fact, what wins hearts and minds over. Wrap up your story nice and tightly with a clear look and goal to the future. Drive home your key message and make it actionable for your attendees. This is the “how” part of the event management process where you emphasize what you need from them and how you’re going to get them there. It’s important to fully understand where your brand is going and how you’re going to help attendees achieve this goal. At this point, they should feel involved in the story you’re telling, and their emotional desire to make customers happy and drive results should be activated. That’s how you create brand advocates. Display your goals in interactive ways. Don’t just do a boring PowerPoint filled with bullet points – use this opportunity to “wow” them! Use experiential methods to showcase your new ideas onsite. Are you adding Coca-Cola Freestyle machines in your stores? Bring one out to the floor and serve it to attendees! Adding a new product to your store? Have sponsors provide samples. Using a new manufacturer? Have them speak on stage, hand out swag and, meet stakeholders who they’ll be working with. Your attendees need to be just as excited as leadership with how your brand’s story is taking shape. Send your attendees home with an excitement and passion for the next year. They should be on the edge of their seats with ideas to implement in the upcoming year. Close the book knowing your readers went home with a story they’re excited to be a part of. 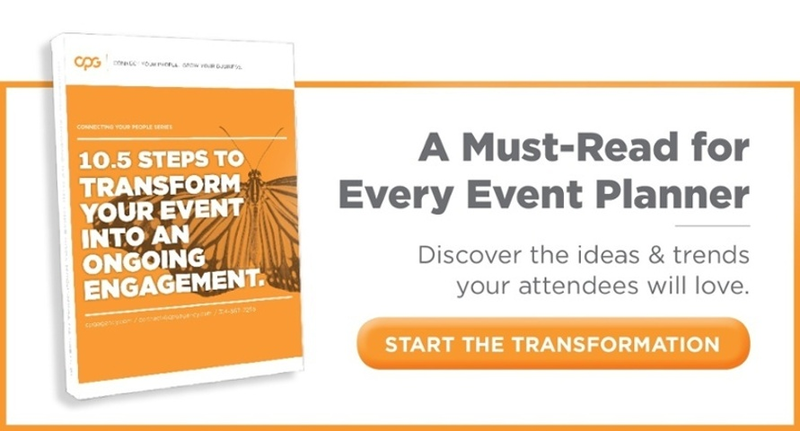 If you’re looking for more information on attendee engagement, click the link below to order our eBook “10.5 Steps To Transform Your Event Into An Ongoing Engagement”.